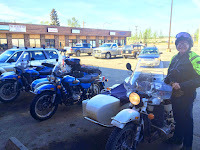 Last night, BruceW, the Ural rider from Ketchikan that rode to Fairbanks last January, called and mentioned that he was back in town to pick up his rig. We made arrangements to meet at College Coffeehouse this morning and RickS, shown here on the left, came by in his new 2013 Patrol that he just picked up and drove to Alaska from Illinois. I had purchased my 2012 Patrol from RickS last summer. Later in the morning, JedR brought his new 2015 fuel injected Ural by as well. I think that this must be a record for Fairbanks. Four rigs at one time. Ironically, I had just talked to RickS yesterday at the Napa store while I was shopping around for a gas cap. I forgot to mention that I had lost the Ural gas cap somewhere in Cantwell. I had stopped at a gas station and removed the cap. Their card machine wasn't working so I hopped back on and rode about ½ mile to the other gas station. Upon arriving, I noted that I had forgotten to replace the gas cap before taking off. Couldn't find it along the side of the road. For the rest of the trip a piece of duct tape served as the gas cap. I had stopped at several auto parts stores once I hit Wasilla but since they don't have caps hanging on the rack anymore it was hard to find a match. They kept asking what kind of car. I had stopped to see Mickey but he only had the older non-screw on caps lying around. I did find on Soviet Steeds, a Ural online forum, that a Stant 11871 gas cap will work. It took a bit of digging on the Internet until I found a website that mentioned all of the cars and trucks that used a Stant 11871 gas cap. One of those listed was a mid-80s Saab. I just happened to have one of those sitting in our yard. And just like it said on the Internet, the old, faded gas cap really does fit. While in Anchorage, I did order a replacement from Crawford Sales in Michigan. They had the aftermarket non-locking gas cap instead of the expensive stock locking version listed on their web site. Mickey is in the process of moving his Ural business from Anchorage to Delta. A better location for me as it would only be 100 miles down the road. Most of his motorcycle stuff was packed into ten shipping containers. Just a funny thing happened today: The big gruff old driver for a plant stock delivery was wearing a Harley shirt. 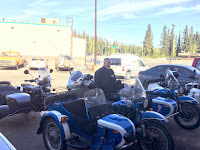 I told him I knew someone in Fairbanks with a Ural who rides all year round. He said, "I just moved to Arizona with my Harley and I ride all year round, too." Welcome to Arizona. Where you move north to escape the summer! So, are these all of the Uralists in Alaska? I thought it hilarious that you just happened to have the right "parts car" sitting around. Not even close. I think that there are probably ten more just in Fairbanks. I was surprised to see the Saab listed along with all of the Chevys and Fords. I think the fickle hand of fate was at work with having the old Saab & the part to fit. 4 URAL rigs at the coffeehouse....how times have changed! As to the gas cap, quite serendipitous, don't you think? that a cap that fit was in your own yard. Happy to also hear that Mickie is moving his shop to Delta, much more convenient for you as you said and I am sure he'll be happier as well. George was really getting into this and calling additional folks to come by. Yes, times have changed though during the summer, 3 rigs aren't unusual. George, Ken and myself. Doh! You may want to put the new gas cap on a tether of some sort. Cool that you managed to get 4 Urals all together. Of course I am partial to the blue and white ones. I think you are right on about the tether. I was thinking of just drilling a small hole for some parachute cord and attaching it to the handlebars. I believe that these are the only blue and white ones in Alaska. The majority seem to be camo. RickS is thinking of painting his other Ural a yellowish-orange. The same as his helmet. Sometimes it pays to never throw out anything, in your case a Saab. Really, who just happens to have an 80s something Saab in the back yard just when they need it. Well done, I love it! You mean everyone doesn't have old Saabs in their yard!? Saabs were actually pretty popular around here. And it's not uncommon to see them driving around.